Serve a touch of mystery with your tea, coffee or cocoa, when you use the Maxwell and Williams 14-oz. Enchanted Garden Mugs (Gift-boxed set of 4). 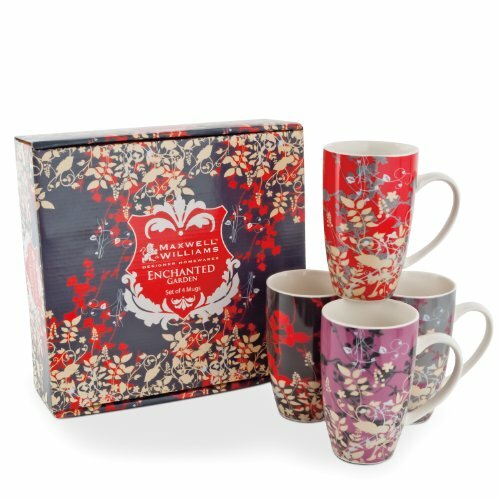 Each of the 4 mugs features a beautiful floral pattern on a background of deep red, purple or blue. With its retro shape and ample handle, the Flower Power Mug is perfect for your favorite hot beverage. This 4-piece set makes a thoughtful gift for friends or family. The 14-oz. porcelain mugs are microwave safe and dishwasher safe. An Australia-based brand established in 1995, Maxwell and Williams offers an extremely diverse collection of homeware made from a multitude of materials including ceramics, glass, stainless steel and acrylic. Our collections encompass the entire spectrum of homeware from the kitchen to the tabletop. Maxwell and Williams provides consumers with quality, affordable designer homeware that celebrates the joy of living.